The movement opposing the Kuokuang Petrochemical (also known as the Eighth Naphtha Cracker Plant) may be one of Taiwan’s largest scale social movements in recent years. In 2006, after the Democratic Progressive Party’s Su Tseng-chang took on the role of Premier, he started the “Big Investment, Great Warmth” program to list Kuokuang Petrochemical as a major development project. Originally sited in Yunlin County next to Formosa Plastics’ off-shore Sixth Naphtha Cracker development, the location was changed to Dacheng Township in Changhua County, where the local government was more receptive. In 2008 when the Chinese Kuomintang (KMT) regained power, government support for this project continued. Kuokuang Petrochemical’s plans included the reclamation of 2,700 hectares of land off the coast of Fangyuan and Dacheng Townships in Changhua County. Subsequently scaled down to 1,900 hectares, the choice of site remained controversial given that the area is among the hardest hit by severe land subsidence in Taiwan. Building the plant here would also devastate the rich biodiversity of the coastal wetlands, the area’s flourishing oyster industry, as well as the habitat of the critically endangered population of the Taiwanese white dolphin (Sousa chinensis). The Changhua and Yunlin region is Taiwan’s major producer of food. To name but a few, it is the source of 80% of Taiwan’s chicken egg production, 80% of clam production, 40% of vegetable and pork production, and 30% of Taiwan’s rice production. 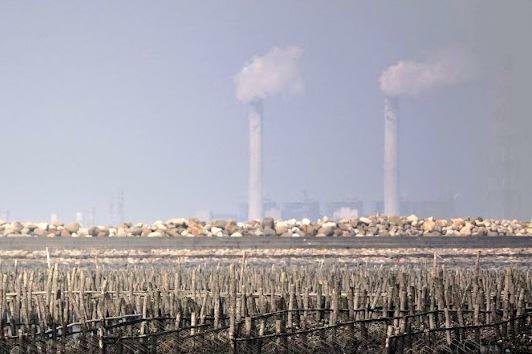 According to the developers own data projections the plant would bring increases in pollutants dioxins and sulfides, as well as, according to estimates by academics, an additional 339 to 565 deaths annually from cardiovascular diseases and lung cancer, not to mention a rise in respiratory diseases. Recent studies have also noted that the putative additional PM2.5 particulate matter generated from the project will decrease the average lifespan of Taiwanese by 23 days. Thus the health risks and social costs far outweighed potential short term economic benefit. The Kuokuang controversy was not limited to food security, land subsidence, biodiversity and health. Implicated were also issues of greenhouse gas emissions, potential transformation of the coastal geology and indeed general industrial policy given that the nation was running a surplus of petrochemicals and that most of Kuokuang’s products would be for export. This development project was thus a microcosm of Taiwan’s skewed development priorities, demonstrating as it does the lack of attention to long term planning, the ignoring of comprehensive planning, and disregard of existing zoning laws. Taiwan lacks a viable industrial development policy and repeatedly fails to use the policy mechanisms such as environmental impact assessment or administrative hearings to address these issues. On the other hand, this case was able to generate an opposition that ran across all sectors of civil society including academia, the arts, the medical profession, social activists, high school students, and very importantly, the people living in the area of the proposed project who would have been most directly affected. The amalgamation of these forces resulted in pressure on the government such that it was forced to call off the project on 22 April 2014. 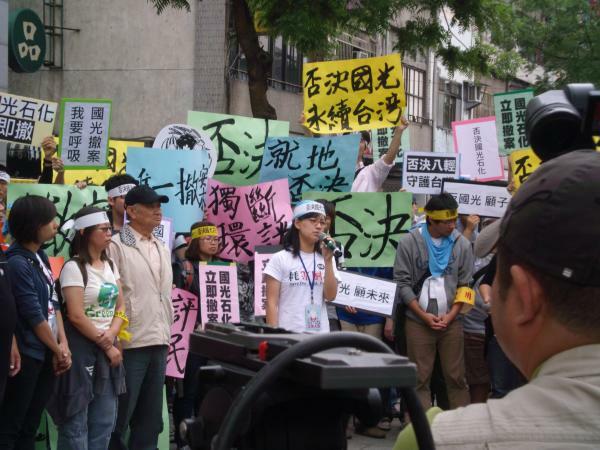 Many organizations and individuals participated in the movement to oppose Kuokuang Petrochemical. Wild at Heart is honored to have had an opportunity to join this civic movement. We are particularly grateful to our former colleague Janis Wang (Wang Chia-chen) who conducted strategy, liaison and overall planning, as Lu Shih-wei, one of our lawyers, and who provided legal guidance and engaged in the National Youth Alliance Against Kuokuang Petrochemical Project for publicity work. As goes the slogan we often used at public gatherings and actions, “Taiwanese youth (citizens) stand up, down with Kuokuang”, only through the maturing and awakening of the people’s power, will Taiwan be able to realise a true and sustainable democracy.